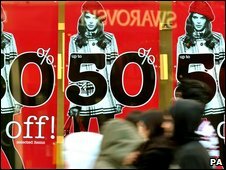 High Street sales have fallen for the 10th month in a row in January, a study by the CBI business group has found. Looking ahead, the CBI also found that more retailers now expect to see their sales decline next month than at any time in at least 26 years. These are the main findings of the organisation's latest monthly Distributive Trades Survey. It found that 47% of shops said sales fell in the first two weeks of January, and that 52% expect a February decline. The forward-looking figure for February was the worst since the CBI stated to collate the data in 1983. "Most of the retail sector continues to struggle as the recession bites more deeply and February will be tough," said CBI chief economic adviser Ian McCafferty. "It is possible that pre-Christmas discounting by some retailers numbed many shoppers to the allure of the new year sales." The CBI found that all retail sectors saw sales fall in the first two weeks of January, with durable household goods (such as electrical equipment) and clothing retailers reporting the heaviest declines. "Later this year, we hope to see some benefit from recent interest rate cuts, falling inflation and the Government's steps to kick-start lending," added Mr McCafferty. "But retailers will still have to work hard to coax anxious consumers back into the shops."